Football and baseball have a certain way of derailing even the most meticulously planned seasons, but (barring a Derrick Rose knee explosion or a Kevin Durant foot-shatter) basketball tends to flatten all mitigating factors and let its talent rise to the top. Last year’s Rockets team accomplished nothing aside from putting this theory to the test. Coming off a conference finals appearance, they turned the concept of uninspired and dysfunctional basketball into a five month-long performance art piece, getting their coach fired 11 games into the season and ending it by getting wiped out of the first round by a Warriors team that barely even required the services of Steph Curry. This year promised to be better, for reasons as simple as finally breaking the awkward forced marriage between James Harden and Dwight Howard, and Harden finally completing leadership functions as basic as working out with his teammates in the offseason. 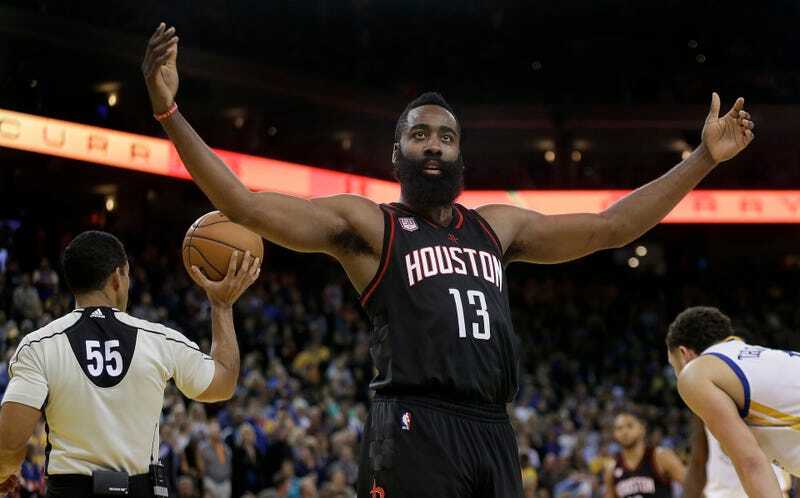 But last night’s thrilling back-and-forth victory over a Warriors team that is regenerated in its own right was confirmation that the fun-and-gun Rockets are not just back, but probably better than ever. But even beyond Harden, Houston’s roster looks like it has settled neatly into place. Ryan Anderson, an offseason splurge, has looked as good in the Mike D’Antoni offense as the basketball gods intended. He’s shooting a career-high 42 percent from three, and last night he was even better, hitting five of his 10 threes while generally launching them indiscriminately from anywhere on Houston’s side of the court. Previous incarnations of Harden’s Big Top Rockets aimed to win the three-point battle not by having the best shooters but simply by shooting the most threes. They still do the latter, but also now pair one of the league’s deadliest off-the-dribble long-range bombers (Harden) with one of its most consistent pull-up snipers (Anderson). Combined, Dekker and Harrell put up 24 points on 10-19 shooting to go along with 18 rebounds, three assists, three steals, and a block. Dekker hit some open threes, was able to finish contested shots at the rim, and generally felt like a positive force within the game. It was a particularly good night for both players, clearly, but the Rockets already trust them and have so far seen their faith rewarded. It’s a long season, obviously, and Houston is not without flaws. But after the addition of Dwight Howard accelerated the Rockets out of the Western conference herd and then straight into a wall, this year’s version of the team looks like it could fully deliver on the promise of James Harden as superstar. If the Thunder had to die, this may be the best of what we could have hoped to rise from the ashes.